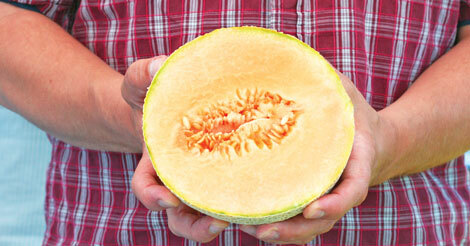 One of the basic facts about melons is that they can be challenging to grow well here in south coastal BC. But with a bit of added heat they can be very productive. Melons picked fresh from the vine are unbelievably sweet and, like so many other kinds of garden produce, are nothing at all like the ones you might find in a grocery store. The flavour and sugar content of fresh melons are positively mind-blowing, and make the effort to grow them very worth while. Both watermelon and muskmelon (a term which includes cantaloupe, honeydew, and others) are members of the family Cucurbitaceae, so they are botanically similar to both cucumbers and squash. The larger family is referred to as the Cucurbits. The growth habit and the formation of fruits are similar across the family and there is a bit of crossover in the general ways they are described by their common names. All of the melons are vine-forming annuals that produce what is known by botanists as a “pepo” — actually a type of berry, rather than a true fruit. A pepo has a thick rind with a fleshy interior, housing seeds at its centre. Other plants that produce pepos include bananas, squashes, blueberries, and cranberries. The difference between a pepo and a true berry has to do with the position of the plant’s ovary within the structure of the flower, for it is the ovary that swells into the edible portion. Watermelons are thought to have originated in southern Africa, where other variations, sometimes with bitter tasting fruit, still grow wild. The sweet fleshed varieties we know today have been cultivated since at least 2,000 B.C., and watermelon seeds were among the items found in the tomb of Tutankhamun. Watermelons were certainly cultivated in China by the 10th century AD, and had migrated to European gardens around the 13th century. The first reference to watermelons being grown in the Americas is from the 1500s, when French explorers noted Native Americans cultivating the plants in the region of the Mississippi. A debate remains about whether the plants were introduced to America by settlers or by African slaves. Watermelons typically have thick grey or green (sometimes mottled or yellow) rinds over red, pink, yellow, or light green flesh. Scores of cultivars have been bred for short season maturity, resistance to disease, and to maximize sweetness. As its name suggests, the fruit is composed of about 90% water. The whole fruit is edible, including the rind. In Chinese and Eastern European cuisine, the rind is often pickled. The most nutritious portion of the fruit may be the soft, white, inner rind, although this is often discarded as it has virtually no flavour. Watermelons are a good source of vitamins A, C, and folate, as well as the minerals potassium, phosphorus, magnesium, and calcium. They are also high in beta carotene and lypocene. 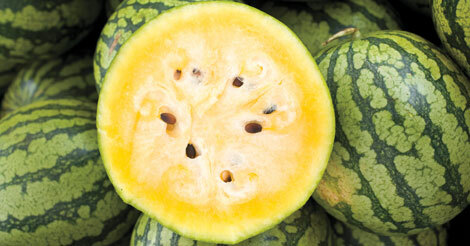 Muskmelon is the generic term for “true” melons, which are all members of the genus Cucumis. The species Cucumis melo includes the recognizable cantaloupes and honeydew melons, as well as crenshaws, casabas, and Armenian melons (which resemble cucumbers to the point that they are marketed as Armenian cucumbers). Earlichamp is a good cantaloupe for areas with cooler summers. Canataloupes are divided, within the species C. melo, into two subspecies: The European cantaloupe (C. melo lymphothelialisis), and the North American version (C. melo reticulatus). We tend to know, and grow, the North American variety, with its familiar netted (reticulated) skin, orange flesh, and subtle sweetness. Both varieties descended from tropical plants that were cultivated in ancient Egypt and India, and popular in both Greek and Roman cuisine. It is thought that cantaloupes were literally brought to North America by Columbus in 1494. By 1881, the Burpee Seed Company had introduced the cultivar, “Netted Gem” for growth in temperate gardens in the northern US and southern Canada. Since then, the cantaloupe has remained a coveted prize for gardeners — an oddball, end of season treat, weather permitting. Because of the netted skin, the fruits are well-known to harbor bacteria, including salmonella. Store-bought fruits may be treated after harvest by washing in sodium hypochlorite, to kill bacteria, but this can also affect the aroma of the fruit. All the more reason to try for a few in the home garden to enjoy fresh in late summer. The honeydew melon is a cultivar of the cantaloupe known as White Antibes that gained popularity in France and North Africa. 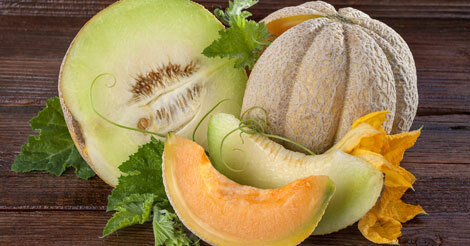 “Honeydew” is simply the American name for this variation on the muskmelon. Honeydews have sweeter flesh than cantaloupes, and it is greenish white, not orange. It also has a much subtler flavour. In the 1940s an American diplomat introduced the honeydew to China, where it was widely and happily received. These are now grown across Gansu province and referred to as Bailan melons. Each August, the town of Sunland, California, celebrates the Sunland-Tujunga Watermelon Festival, where free watermelon is served in a carnival setting that features the Seed Spitting Contest, the Watermelon Eating Contest, the Greased Watermelon Relay, and, of course, the crowning of the Watermelon Queen. Prizes are awarded in the largest, sweetest, most colouful, and most unusual watermelon categories. On the opposite side of the continent, in Halifax County, Virginia, one can attend the Virginia Cantaloupe Festival in late July. Music, food, and contests have become a major draw for this popular event. Watermelons can have red, pink, orange, or yellow flesh, like Yellow Doll above. The secret with all melons is to provide masses of heat, excellent drainage, and ample water throughout the season. Difficulty: Moderately difficult. Large raised beds are perfect, but containers are not. Timing: It is essential to start seeds indoors or in a greenhouse mid to late April. Transplant at the end of May or first week of June when the transplants are 5 weeks old. Melons need really warm growing conditions—use black plastic mulch, cloches or floating row covers. Success may improve in raised beds, or by combining all these methods. For best results, grow in a poly-tunnel or similar environment. Sowing: Sow seeds indoors, 2cm (¾”) deep, in 13cm (5”) pots, 2 seeds to a pot. If both seeds sprout, pinch off the weaker plant rather than pulling it. Soil: Choose a warm, well-drained soil in full sun. Raised beds work well. Add dolomite lime, compost, or well-rotted manure to the bed and ½-1 cup of complete organic fertilizer mixed into the soil beneath the transplant. Optimum pH is 5.8-7.0. Growing: Melon plants need 8-10 weeks of good, hot growing weather from the middle of June to the end of August. During that time, a melon vine must grow 5-9 leaves before starting to flower, then set 4 or more male flowers before making its first female flower, and then ripen its first set of melons before cool damp weather sets in. Harvest: Expect one, possibly two melons per plant. Fruit will ripen in late August/September. Fruit will not ripen off the vine! Ripe cantaloupe will easily detach from the vine when light finger pressure is applied to them. Watermelon is ripe when the tendril nearest to the fruit is dry. Seed info: In optimum conditions at least 80% of seeds will germinate. Optimal soil for germination: 20-25°C (68-77°F). Usual seed life: 3 years. Growing for seed: N/A — Seed not reliable in this climate. Hybrid varieties will generally produce the best results. Pests & Disease: White spots on the leaves are a fungus, Powdery Mildew, which can appear at the end of the season. Resistant varieties get the mildew a few days later than the others. Various wilts (Fusarium, verticillium, bacterial) cause the vines to wilt and die. To control wilt, observe strict sanitation in the garden and greenhouse, avoid over-watering, plant in well drained soil, use long rotations, and (very important) use of disease resistant varieties when available. Home Run is another excellent choice – productive in cooler summers, but even more so with added heat.